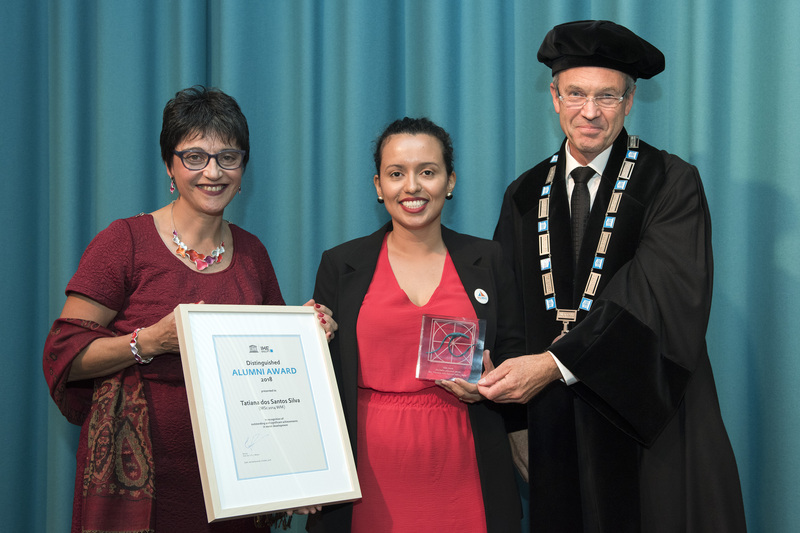 The Rectorate was pleased to present Ms. Tatiana dos Santos Silva from Brazil with the IHE Delft Alumni Award 2018. The award is given annually to an alumna/alumnus who has proven to be a role model for other water professionals, by demonstrating the impact of her/his work in a water related field, to improve people's quality of life. In 2018 for the first time the younger generation of alumni - those who have graduated in the last 10 years – has also been invited to participate. Tatiana dos Santos Silva is a co-founder of the non-governmental organization FA.VELA, that leads resilience and entrepreneurship projects in low income communities in Brazil. She is an alumna from UNESCO-IHE who draws on her entrepreneurial career, her work with vulnerable Brazilian youth and her role at Water Youth Network. After obtaining her UNESCO-IHE diploma in Water Conflict and Management just a little over four years ago, Tatiana Santos has already achieved a great deal, working for FA.VELA, an organization she co-founded. She is also a board member of the Water Youth Network. With a background in Social Communication and Social Sciences, she says entering the water sector was an “accident”. Reflecting on her trajectory, Tatiana says, “I used to think that the water sector was meant for people with a background in engineering. It was only when I finally took the time to research the Institute and read about courses such as water management and water conflict management that I decided to apply to study at UNESCO-IHE (now IHE Delft)”. Tatiana’s diploma was obtained with ethnographic research on the power politics in water service modalities in Greater Maputo, Mozambique, where she spent five months. During this period she says, “I became disappointed with the whole development industry in general. It was a feeling that no matter what I would do, there would be no real change”. On her return to Brazil, Tatiana says: “I started thinking of activities and projects that my partner and I would like to do to change the scenario in our community and how we could be agents of change at the local level, using our knowledge and experience. That’s how FA.VELA came to be”. As a water professional turned into a social entrepreneur, Tatiana says that her “initial idea was to develop capacity, such as training micro-entrepreneurs to develop the local economy in vulnerable areas”. Together with her partner, they designed what they called the “acceleration project” in which they offer content knowledge related to business and management for micro-entrepreneurs to model sustainable enterprises. She adds, “We try to enable them to become leaders and generate income to change their communities”. On the importance of her project to Brazilian slums, she believes “it empowers vulnerable youth and puts them at the centre of the creative process of designing, not only business solutions to urban resilience in these vulnerable territories, but it also enables them to design solutions to overcome their development challenges”. When asked about challenges she faced while developing FA.VELA, Tatiana says, “I think the academic world as it is, currently does not prepare us for an entrepreneurial role. There is a gap between academia and the real world when it comes to turning some of our knowledge into action. It is always hard to start a journey that you had no preparation for, but it is certainly rewarding”. Tatiana joined the Water Youth Network, (an organization connecting over 150 water professionals from around the world), in 2013 as a volunteer during her Master’s studies at UNESCO-IHE. In 2017 she was elected to the advisory board. Her work of empowering youth through FA.VELA and the Water Youth Network led the World Water Council to select her to represent the Americas as a Youth Delegate at the 8th World Water Forum that took place in Brasilia. On her role at the Forum, Tatiana says, “I am very proud of the work we did. Under my lead, we co-designed a strategy called ‘Youth Satellite Event’, in which young people could lead independent water events, in their regions, to discuss the significant issues related to water in their cities. We had over 20 Youth Satellite Events. Each satellite event created a Youth Statement that was presented at the Forum to the World Water Council that resulted in the Youth Declaration. Tatiana: “Our work goes beyond the Forum and we communicated that message to the groups - that although we had the opportunity to present and discuss out thoughts at the forum, what really matters is what we do when we are back home and how we will continue to connect the people with our municipalities or water utilities. Do they know in which basin they are living? How good is the river basin management and how does it work? We really focus on making this message clear and on helping them to find out more about the water sector in their areas”. Goals for FA.VELA: We are focussing a lot on transitioning our methodology to the digital world as well because this is the key to scale. We are also designing agents that can replicate and reproduce the methodology in different slums because we need to provide the same opportunities to people living in other slums in Brazil and later in other countries in Latin America. This is a region in the world that is struggling a lot with urban growth and climate change and we see vulnerable areas becoming more vulnerable, which represents a challenge to make cities resilient. So in this sense FA.VELA is vital in supporting the adaptive capacity of cities. About her time in Delft, she says it was her first time living in a small city: “I loved the environment in general and the architecture but what I would highlight about Delft and IHE Delft in particular is the amazing way in which they facilitate the connection with people from all over the world. I learned a lot not only from classes and courses but from the connections I made with other students, by learning about the water issues in their countries and cities, and their approach to solving them. As for what inspires Tatiana, she says, “Go beyond yourself in the process. I know we want to stick to our Master’s and research topics but we have to be able to see how it connects with the world. This includes not only the environment, but the social impact of what we study and how relevant it is to really improve the lives of the most vulnerable in terms of access to water and sanitation. So, my message is ‘know who you represent’. When I was at IHE Delft, I had my personal background but I would always be the Latin American girl or the Brazilian girl and when I was there, in a way, even if I didn’t want to, I represented their interest and I started thinking how my research could impact their lives and so I started thinking beyond my own interests”. “So my message to aspiring water professionals is: Think beyond yourself and your own field of interest to see how your work can impact the daily lives of those who do not have access to water and sanitation”.